Aid & Abet’s exhibition at North West Cambridge studios. The exhibition GRAVEL: notes from the other side of the fence was open to the public on 29th and 30th May 2015. 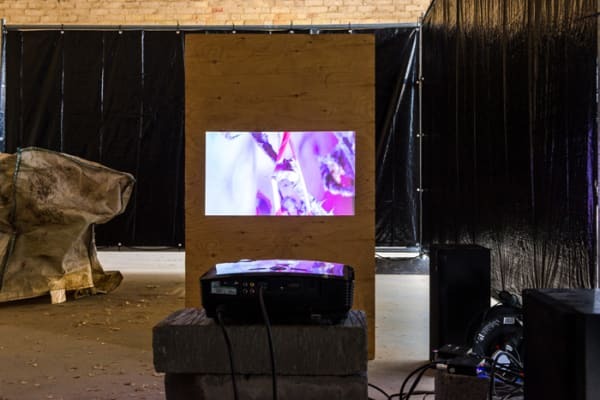 It featured film screenings, installations, a seminar, talks, tours and entertainment for the opening night and took place in locations at Gravel Hill Farm, the heart of the University of Cambridge’s development. The public event featured new works by each of the artists who participated in the yearlong residency. The film Century Egg by Bedwyr Williams takes the viewer on an imaginative and witty sojourn through the collections of the University of Cambridge Museums, as well as the North West Cambridge Development site. García-Dory devised an installation and seminar to discuss and reflect on sustainability in the built environment in relation to the North West Cambridge development. Aid & Abet displayed sculptures, drawings, photographs and films made during their residency, all relating to the land surrounding the studio at Gravel Hill Farm.